Happy Independence Day! So proud to be an American. This is the land where dreams do really come true! 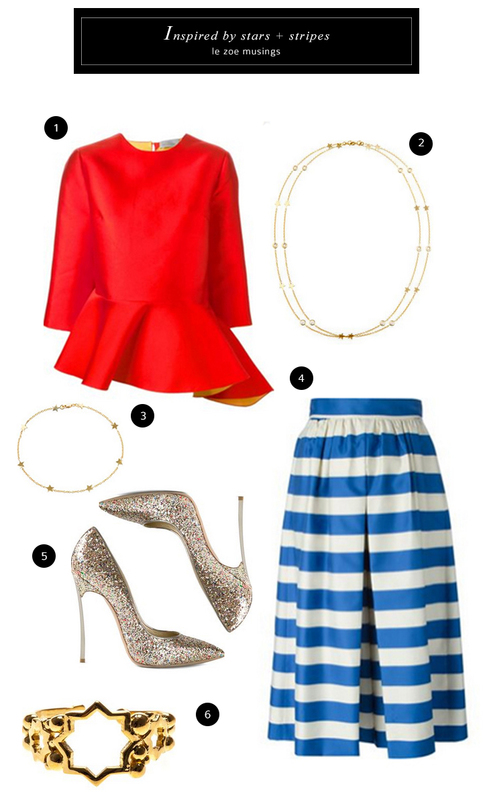 In honor of July 4th, I’ve curated an outfit inspired by the almighty stars and stripes. This look is bright and confident with all the details that scream July 4th. Stars check. Stripes check. Red, white, and blue check. Fireworks check check. Yep, it’s those sparkly shoes finishing off with a bang just like a firework finale!! Enjoy. 1. PREEN BY THORNTON BREGAZZI ‘Cadogan’ peplum top 2. LUIS MIGUEL HOWARD 18kt gold stars and diamond necklace 3. LUIS MIGUEL HOWARD 18kt gold and diamond star bracelet 4. ALICE+OLIVIA striped culottes 5. CASADEI sparkle stiletto heel pumps 6. LEIVANKASH cut out star open ring. Enjoy the holiday weekend and be safe! Happy Fourth of July to you too…..love the star bracelet……..